The modern potable water systems are very sophisticated. They typically consist of Series of Filters, Reverse Osmosis system, (optional) Remineralization unit & Disinfection Unit like UV and/or Ozone dosing system. 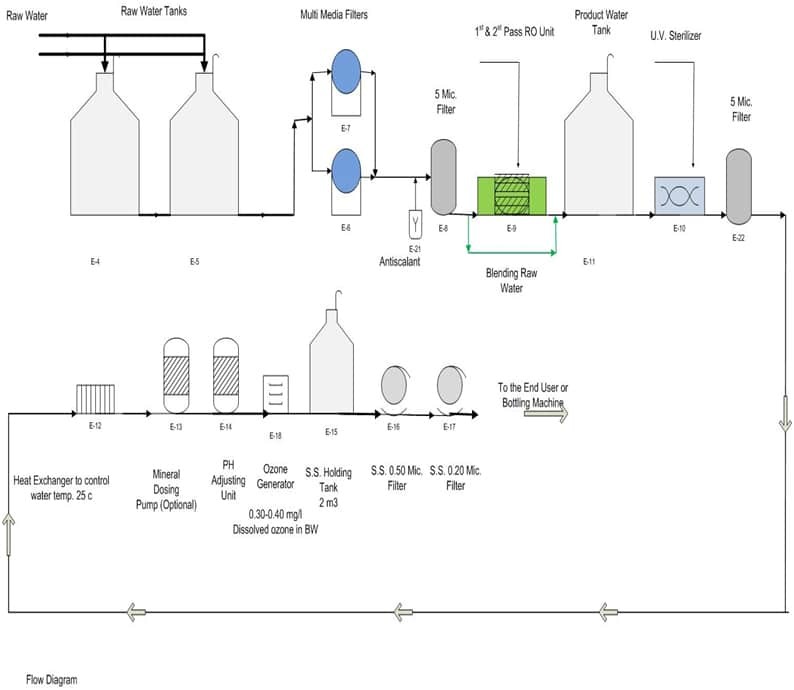 A following scheme is normally adopted for Potable water or Bottling water plant. All the subsystems have been discussed below. Multi Media Filters remove the suspended matter in the raw water. Normally the MMF will remove particles above 25µ size. To mitigate the possibility of Scaling of saturated salts, Antiscalant is dosed. The dosage would be 3 -5 ppm. The RO Skid holds the RO membranes in the Pressure Tubes. The system is complete with requisite High Pressure Pump, Instrumentation etc. UV system removes the bacteria & Virus that may be present in water. The Micron Filter removes the residual material formed due to oxidation of organic matter formed during UV radiation. Heat exchanger will moderate the temperature within the range. To balance the Ca content in the water if Raw water is not blended. To adjust the pH to make it suitable for potable use. Ozone is used to eliminate the any traces of microorganisms if escaped in UV treatment. The Fine Micron Filter removes the residual material formed due to oxidation of organic matter formed during Ozonation. Among many standards of Potable water notable among them is US standard, EU standard & Japanese standard. 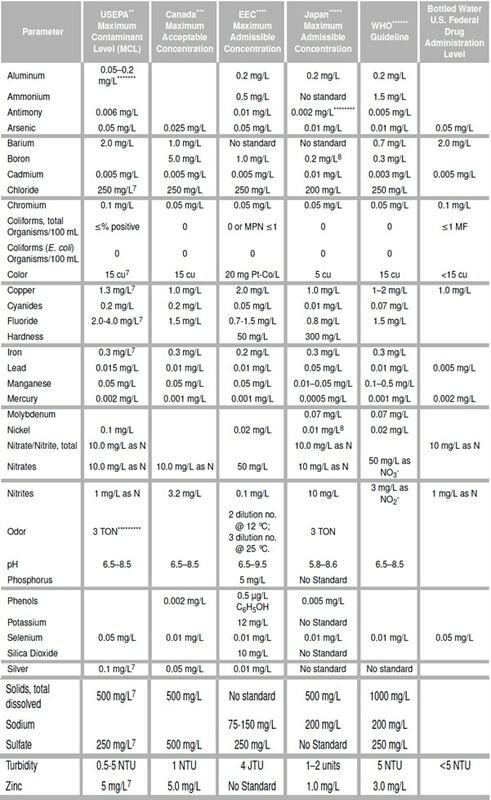 The table below depicts the comparative of various standards on major parameters for Potable water.